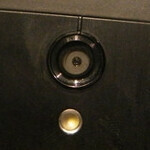 The Sony Xperia ion represents a lot of firsts for the Japanese based electronics giant. It is the first handset produced by Sony after it bought out long time joint venture partner Ericsson. It also is the first Xperia branded phone to have a dual-core processor under the hood and is also Sony's first LTE enabled smartphone. 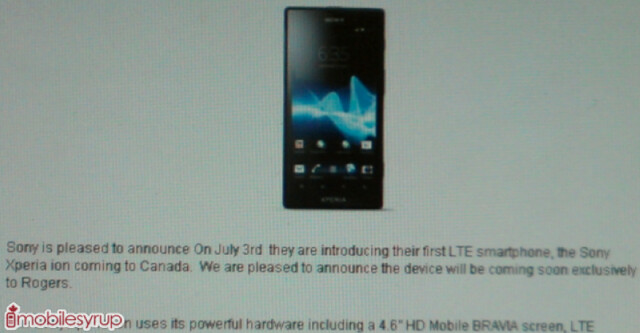 A leaked internal document indicates that the Sony Xperia ion will be an exclusive for Canadian carrier Rogers. 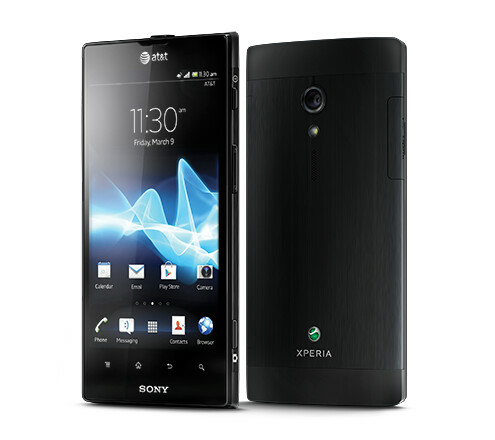 The Sony Xperia ion has already been launched in the States via AT&T and while it was released with Android 2.3.7 in the U.S., the phone will have Android 4.0 installed out of the box in Canada according to the document. That obviously has to do with the July launch of the phone up north. We'd love to tell you the pricing scheme for the Sony Xperia ion from Rogers, as well as a definitive launch date. We would love to, but can't as the leaked information does not mention any of those fine points. We can refresh your memory by telling you about the wonderful 4.6 inch screen on the device with resolution of 720 x 1280 which results in a very readable pixel density of 323ppi. Under the hood is that aforementioned dual-core 1.5GHz processor with 1GB of RAM and 16GB of native storage. There is a 32GB capacity microSD slot, but the piece de resistance is the 12.1MP camera on back that captures video at 1080p. There also is a front-facing 1.3MP shooter for self portraits and video chat. The device sports a 1900mAh battery and offers LTE connectivity. One feature pushed by Sony is the 2 second response time the phone takes to go from standby to being ready to capture an image using the camera. This is an area that manufacturers have been working hard on. Unless they develop a camera sensor that reads minds and opens before you press the button, there is a limit to how quickly the camera can be turned on. No, we're not there yet, but perhaps by next year. I'm just waiting eagerly for acro S can't wait to get my hands on it,thought of buying GSIII but i thought i'd rather take a rugged acro s and take underwear shots! I know this article's not about acro S but damn i'm desperate! underwater shots haha not underwear!! :D Arco S great phone!! haha... you got me..yeah underwater shots! !